When visiting the Grand Hyatt Tokyo, one might encounter an impeccably dressed, broad-shouldered individual diligently picking up absent-mindedly discarded bits of trash, returning a stray pamphlet or straightening a sign. It might be surprising to learn that the person in question is not a member of the hotel’s cleaning staff, nor one of its sedulous bellhops, but its unassuming general manager, Steve Dewire. With such a long and distinguished career, it’s surprising Dewire can. Raised in Lynchburg, Virginia, Dewire was just 17 when he landed his first job — seasonal work with Walt Disney World in Florida. Four years later, he entered Hyatt Hotels Corp. doing various management roles at the Hyatt Orlando, marking the start of a 42-year journey that has seen him make a meteoric rise through the ranks of the Chicago-headquartered hospitality multinational. Within a decade of joining, he was made the Hyatt Regency West Houston’s general manager, a position he has also held at Hyatt facilities in Orlando, Denver and Chicago. He has since been charged with opening three resorts as general manager — most recently, the Hyatt Regency Lost Pines Resort and Spa in Texas. 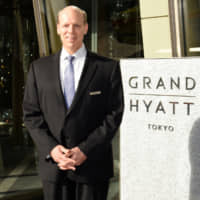 Dewire’s posting to the Grand Hyatt Tokyo in 2014 marked his first overseas assignment, and one he says was unexpected after 38 years serving the company’s U.S. operations. From day one, Dewire had a plan to make that journey as smooth as possible, propelled by an infrangible ability to “look at everything as an opportunity and a glass half-full. “I really believe that coming in with a mindset that you’re willing to observe, learn and understand and then look to see where your experiences and strengths can add value. … (This) is the best combination to most effectively work with teams of people, even during moments when you have to work through different kinds of situations such as where decisions are made in different ways,” he said. One area that Dewire feels he has added value is in “permission” — a term he uses to refer to a more engaging style of guest care. Much has changed in the hotel industry in recent years, with buzzwords like “bleisure” and “healthy hotels” gaining increasing attention globally. However, Dewire believes despite the seemingly limitless potential, hotels will continue to serve their most fundamental function for the foreseeable future. “Guests today are looking for so many modern features in terms of connectivity, in terms of the express nature of their lives,” said Dewire, adding that Japan will come face-to-face with that demand during upcoming global events such as the 2020 Tokyo Olympics. “It seems as though light-years of progress have already been made, but I think technology and robotics will continue to expand in ways we can’t even imagine today. “But I also think that no matter how express, how advanced it can get, how powerful the technology in your hand, there will still be that moment when you want to have that human connection,” he said. Dewire is reminded of the importance of that connection on one particular type of occasion — actually, 570 occasions at his hotel in 2018, to be precise. Weddings are like many other crucial functions of a luxury hotel, including meetings, conferences and exhibitions, where, despite technological advances, “Nothing can replace that moment when you all get together in one place,” Dewire said. Nevertheless, he says Hyatt continues to harness technology, not least of all in its event spaces, and is currently deliberating over next-generation rooms. “More and more homes are incorporating multipurpose spaces and I think hotel rooms can go in that direction, too, incorporating technology to allow a high degree of personalization,” he said. Steve Dewire began his career in the hospitality industry in 1972 doing seasonal work for Walt Disney World in Florida. Four years later he joined American multinational Hyatt Hotels Corp., where he has continued to work for over 42 years, experiencing various roles such as the front office and housekeeping departments and quickly on to positions in management. 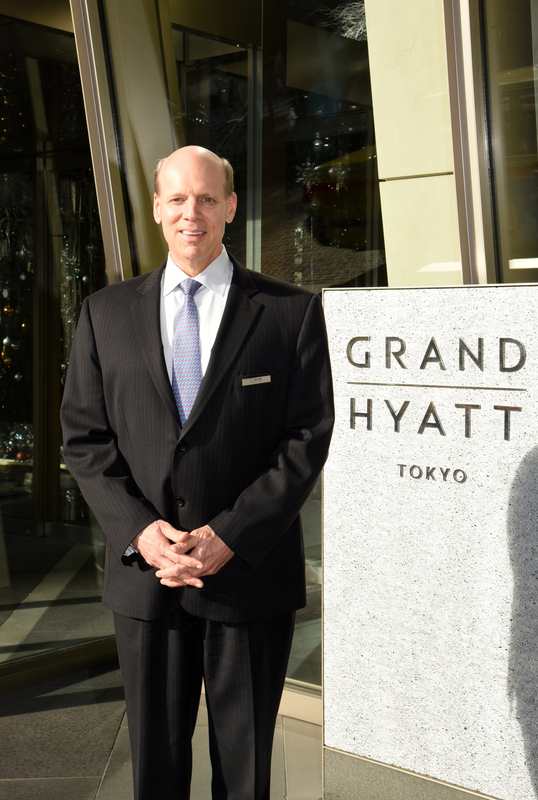 Dewire’s posting to the Grand Hyatt Tokyo in 2014 marked his first assignment outside the U.S. An outdoor enthusiast, Dewire enjoys skiing, boating and cycling. Dewire is heavily involved in Hyatt’s corporate social responsibility activities, which include work supporting disadvantaged children and recovery operations in the disaster-hit Tohoku region. With Barbara, his wife of 41 years, Dewire also enjoys exploring Japan and indulging in another of his passions, photography.